Aug. 22 — Attended St. James Theatre in the evening. Saw Emlyn Williams in “The Wings of Heaven”. Prime Minister Atlee was also present. Aug. 23 — Just starting for Guildford to spend the day with Wynne. Arrived there about noon, so we went out to lunch, then bought the song “I’ll Walk Beside You” and came back and played it and sang it — then Wynne started sewing flashes for me — making a wonderful job. Hope to get my battle suit blouses over next wee for her to do them too. Caught a 10:28 train from Guildford and arrived in Waterloo at 11:30, then underground to Victoria and then home to bed. Aug. 24 — Very dull wet day, have really done nothing all day but write letters and lied around Will try and and go out to a picture show or something tonight. Aug. 25 — Met Pat Cameron outside the house and to my surprise she told me Timmy was home and took me to their flat. Had lunch with Mrs Harrison and her sister and Timmy and Pat. He may be coming back on the same draft with me. Am just starting off to the Ambassador Theatre to see “Sweeter and Lower”. Aug. 26 — Saw the show last night but did not think it was very good. This is Sunday, a most monotonous day. I went for a long bus ride on the top of one of these London buses this afternoon. Will be going back to Camp on Tuesday morning. I certainly hope we are not kept there long, as those Camps are really deadly. Aug. 27 — Went to a picture show — “I’ll Walk Beside You” at Odeon Theatre. Very good music. Aug. 28 — Caught a train at Waterloo and arrived back in Camp to find that our draft was to hold itself available for leaving on Aug. 31. Aug. 21 — Arrived in London and was fortunate enough to get a room in the Legion Club. Will probably take in a few shows and pass the time that way. Aug. 17 — Busy doing office work most of the day — then in the evening phoned Wynne Rolfe. Am going over to see her on Sunday. Aug. 18 — Painting up boxes etc. Am now going to have my after dinner sleep. The rumour is that we sail one week from today. Tonight after supper, some Sergeants from the 14th (Calgary Regiment) looked me up, so we went to the Queen’s Hotel and the Swan. Those present were Price, Morgan, Howard, Patterson, Hobbins, Davis, McCall, McKay, McFadden. It was a real old timers get together. All of us left Calgary together and were together until Italy. It was the first time I had seen them since. Aug. 14 — Returned to London, a London noise and excited. Piccadilly Circus was crowded, the streets were full, flags of all Nations were flying everywhere. At midnight the official announcement of the unconditional surrender of Japan. The noise and celebration continued through out the night but myself, being a very old man, went to bed, but not to sleep for a very long time. Aug. 15 — Today and tomorrow are holidays — Parliament opens today — expect to take part in my first peace time celebration in an English speaking country. It seems impossible to realize that at last — the whole world is at peace. Can we make a better job of it this time? Will we find that the things we have fought for are worth it? Outside my window crowds are already standing to see the great procession. At home you will be listening to an account of the same scene I am witnessing. This is what is happening in London today. What is happening in Calgary? Soon, very soon I hope — I will know. 10:25 P.M. — Have just returned from a full day of celebration, very very tired, but very very well satisfied. I started for Waterloo Place on a bus but could get no further then the Parliament Buildings on account of the crowds, so walked the rest of the way. The bells of St. Paul Cathedral were playing and the whole city was decked in flags — everything was crowded. Soon the rain began to fall, but enthusiasm was not dampened. I found my way to the Mall, just as the Royal Procession passed by. A gorgeous sight — led by Police on black horses, then the Household Cavalry also on black horses, followed by the Royal Golden Coach — drawn by six white horses, the riders in scarlet robes, the Queen in blue and the King in Naval Uniform. This was followed by more Household Cavalry — then several other beautiful open coaches, in one of which the two Princesses rode. After they passed, I worked my way up to the African Portals just as the road widens before the monument of Queen Victoria, immediately in front of the Palace. There, I got a chair and climbed up on it and commanded a wonderful view of the Procession when it returned. I then took my chair to a vantage point just in front of the Palace, with the a grand view of the balcony. The men came out on the balcony and spread the Royal Purple. In about one hours time, the King, Queen, and the two Princesses appeared and stood and waved to the crowd for about three minutes. The scene was very impressive, thousands of people crowded into all the open spaces cheering, waving wildly, and actually delirious with joy. After they withdrew, the crowd dispersed. I went and got some lunch and then went to Piccadilly Circus. The place was mad. An American band was playing. All traffic was stopped and humanity was there in the thousands, singing, dancing, wearing bright ribbons of red, white and blue, colored hats — and streamers of paper and confetti were flying through the air. 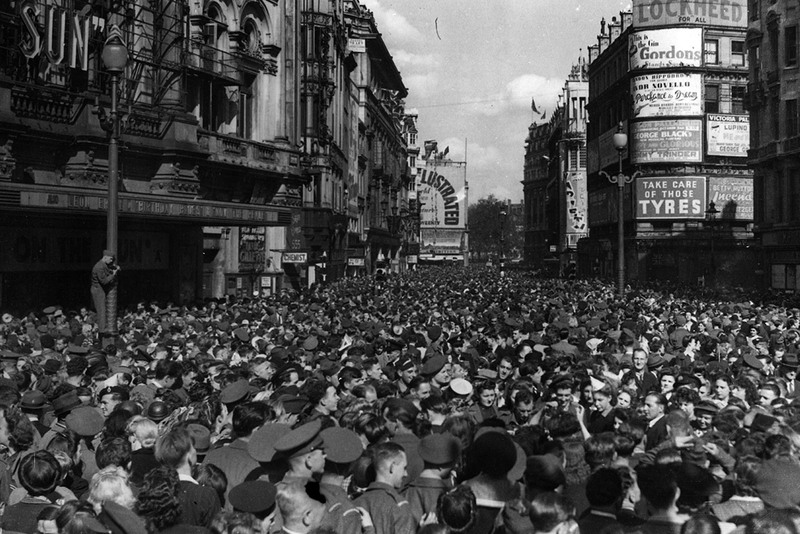 15 August 1945: Crowds assemble in Piccadilly Circus to celebrate the news of Japan’s surrender and the end of the second world war. I worked my way through here and then had a rest until supper time. 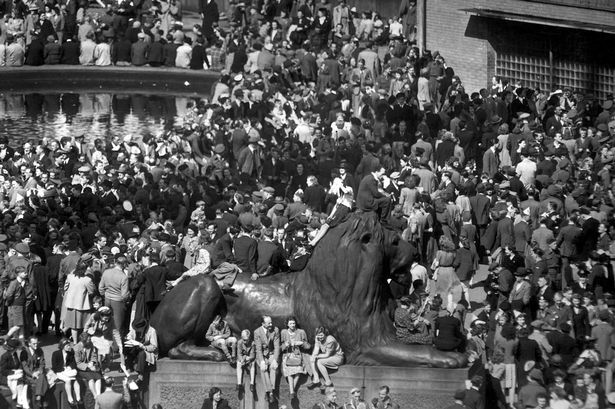 I walked down the Strand, still crowded, to Trafalgar Square — all traffic suspended — a living mass of people — even climbing Nelson’s Monument. The great loud speakers were there playing. Soon a soldier spoke (I know you heard part of this at home) and in the name of the Armed Forces saluted His Majesty the King. 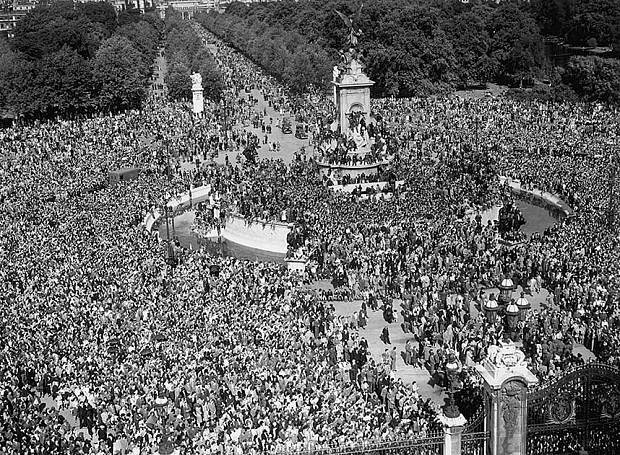 The National Anthem was played — not a sound from this vast crowd who stood rigidly at attention — then the King was introduced and in my opinion gave his best talk to his Empire. This was followed again by the National Anthem, then “Land of Hope and Glory” in which everybody joined — then the “Star Spangled Banner”, the “Oh Canada” and the “Maple Leaf Forever”. This was very impressive and beautiful, in old Trafalgar Square, with the flood lights lighting up everything, even including Nelson high up on his monument. After this, I followed the crowd, through Admiralty Arch, flooded in light, and slowly made my way back to Buckingham Palace, on which the flood lights were playing. The King probably made another appearance, but I did not wait, but threaded my way back to Victoria, and to my room in the Legion Club. I feel very fortunate to have witnessed this scene and can at last understand the Englishman’s love of pageantry. This is the most impressive sight by far, that I have every seen, and I never really knew what crowds were until today. Tonight the fireworks are still flying — the search lights are on, London is a blaze of light and a bedlam of noise. The British are happy. They deserve to be. 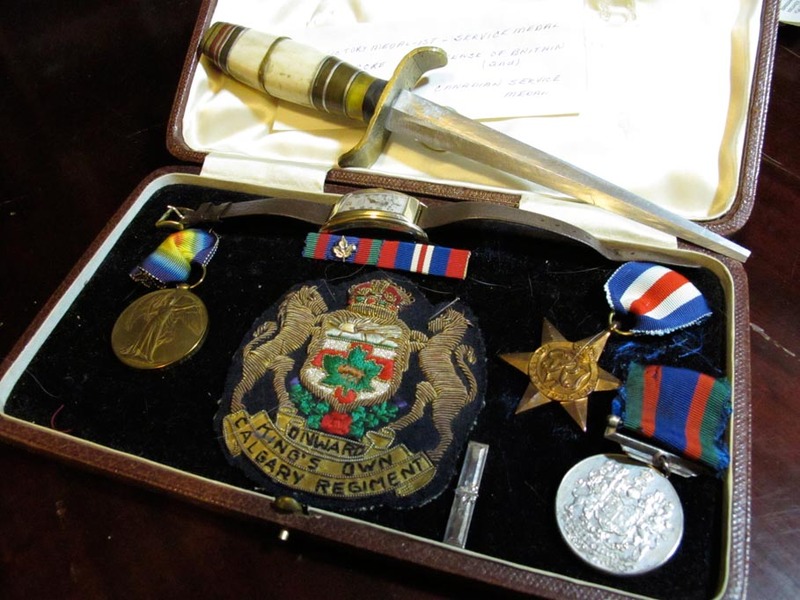 Aug. 16 — Returned to barracks in Aldershot. In the evening Ken Haise and I went over to #4 Can. Gen. Hosp. Saw Vic Matu and Harry Atkinson. Later in the evening we went to a bonfire in the square. Aug. 6 – Everything packed – we move off at 1 P.M. at Aldershot and board a special leave train for London. At 10:15 I leave King’s Cross Station for Edinburgh and Glasgow. Manage to get a third class sleeper and have a pretty good trip up. Aug. 7 – Arrive in Glasgow at 10 A.M. and at Muirs at 12 Noon. Have spent a quiet but enjoyable day. Start back for London tomorrow night. Aug. 8 – Went shopping today and had lunch with Mr. Muir, then went to the usual tea at Craig’s. Helen phoned at 5 P.M., so I went to Edinburgh and spent the evening with her. Aug. 9 – Am leaving from Waverly station tonight for London. I am staying at the Calidonian Hotel. Helen was down this afternoon for a while. I caught the 7:50 at Waverly Station and started for London. Arrived in London at King’s Cross Station at 6:30 A.M. Caught the underground to Victoria, had breakfast, got cleaned up and at 9:25 A.M. caught the train for Worthing. Aug. 10 – We went out to Sleepy Hollow Hotel and visited Mrs. Earl, then came home and spent the evening. Aug. 12 – Sunday, just writing for dinner and will catch the 3:35 for London. Expect to go to Reading tomorrow morning. A lot of excitement about Japan but nothing definite yet. Aug. 13 – Caught the 9:25 train from Waterloo and arrived at Fords in Reading before lunch time. All are well there and I was given a great reception. In the afternoon, we drove to Bearwood, Wokingham and Hurst, revisiting all the old spots I used to know.